Lincoln Golf Club was founded in Lincoln City in 1891 and moved to its present site at Torksey in 1903, where the course was designed by Open Championship winner J H Taylor. The first season's play included a professional match between J H Taylor and another Open Championship winner James Braid, which was won by J H Taylor with a score of 75 + 74 beating James Braid's 75 + 78. The club's championship standard course has been the venue for The English Seniors County Championship, Lincolnshire Open Championship, the Lincolnshire Amateur Championship, and the Lincolnshire Junior Championship, as well as many other County and Regional matches. 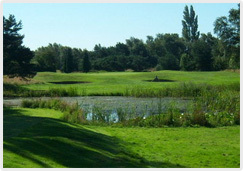 The course has been played by many famous golfers and Mark James, of Ryder Cup fame, achieved a course record of 65 whilst playing in the Lincolnshire Open. The club operates a policy of full equality and we welcome visitors and societies to our course.